PowerCAM pro version 5.5 , newest version of professional CA Module from Powercam is able to descramble several systems with best possibility to reach up to 16 channels. PowerCam Pro is able to simultaneously descramble all transponder content on the professional CATV equipment. Its best choice for companies and installers that are looking for reliable CA Module that is very strictly tested with another professional brands of head ends. Powercam PRO 5,5 have best results after testing with Triax head ends, Wisi, Johansson, Teleste, Tecatel, Ikusi.. Its easy for you to choose which solution you prefer to avoid high expansys with Powercam PRO and offer to your customers reliable and stable Powercam CA Module. 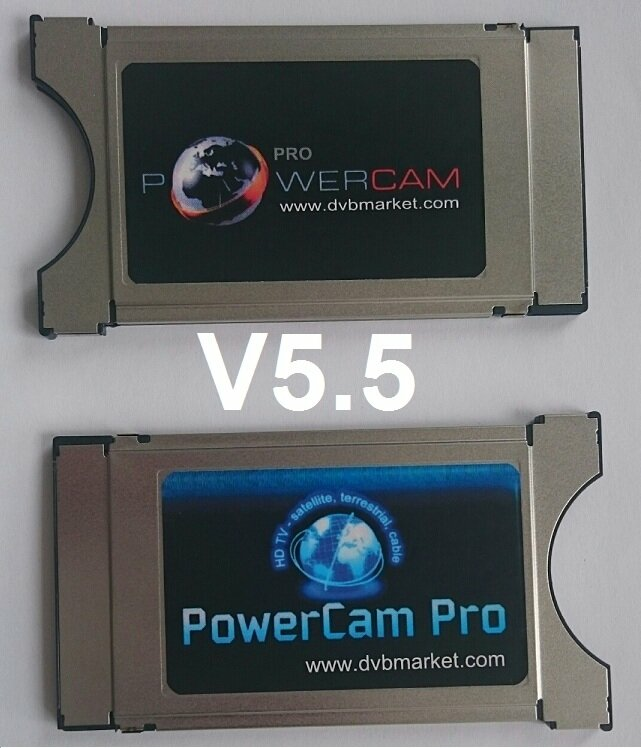 PowerCam Pro 5,5 is a universal professional CA module that allows replacement of several types of decoding modules of one type, which reduces the risk of any exchange in the future, thereby reducing further investment costs. Does the possibility of software updates from the satellite (OTA), so it is ready for any changes in the decoding systems. PowerCam Pro supports multidescrambling on PVR receiver to enable independent watching of a selected channel while recording another one, event. more channels at a time (depending on the receiver capability). PowerCam Pro is able to descramble up to 63 simultaneous PIDs. It is able to filter 63 PIDs (16 filters can be applied to one PID). Multidescrabling performance actually depends on the structure of those services in terms of number of PIDs, and also the resources (filters) needed to process CA information, which also depends on the CAS involved. The smart card capabilities in use (performance, communications speed...) also may affect the performance of the CAM. PowerCam Pro (PCAM V5.5 supports the transport stream data rate up to 70Mbps. This depends also on hardware aspects, such as NIM and descrambler of the STB and hardware layout. In any case, regardless these performance parameters, having in mind all the combinations of CAS, smart cards, "transport stream configurations" and even receivers, it is needed to check the performance of the CAM case by case. However, 12 services are frequently achieved. If you ordering online 1 € (EURO Currency) = $ 1,12 (USD) , in case that you would like to pay in USD, feel free to contact us to make proforma invoice in USD currency.